With Christmas fading into the distance… the frosty mornings haven’t! 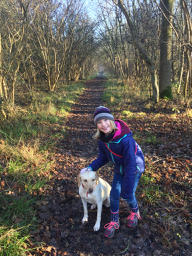 So what better way to spend a morning than grabbing the girls and heading out to enjoy Rockingham Forest with the one member of the ‘LifeinourVan’ family who doesn’t always get on our trips (Tizzy our 3yr old Golden Labrador)…. 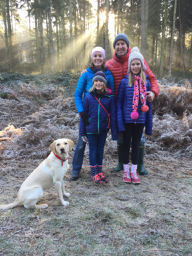 We’re often asked who looks after her when we’re away and we know just how lucky we are that Richard’s sister & parents step up and help here… but both girls love settling back into an easy routine with ​Tizzy… so it’s been morning walks every day so far… but none better than around the historic hunting grounds of Rockingham Forest in Northamptonshire. 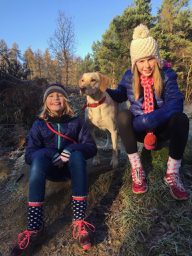 Some 500km² of prime forest offer a brilliant chance for Tizzy and the girls to run wild!! 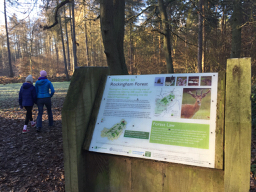 We really enjoy any chance to get out and active, but this small wood also sits alongside Fineshades Wood with it’s fantastic cycle paths… so it may not be the biking trails on the Flamsbana (Norway) or the hiking in the Gorge du Verdon (France)… but to us, it’s perfect!! Great for families or motorhomers and there’s plenty of parking nearby too… For those who love a full site (try the Caravan Club’s Fineshades Site) or there’s plenty of smaller sites nearby at Rutland Water…. There’s trees to climb, cycling paths to explore (on foot or by bike) but everywhere just looks that little bit more magical when it’s dusted with frost…. you could almost imagine yourself in a ‘Chronicles of Narnia‘ production in this crisp white landscape. With New Year looming, we may not get down to spend it Hampshire like last year, but this time we’ll head North to enjoy some time on the North Yorkshire Moors before heading out to start Leg 8…. 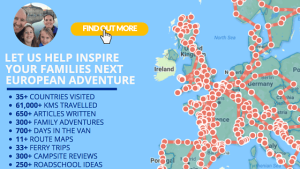 This time we’ll be adding to our growing list of cities that we’ve explored by motorhome… but this time each of the 7 cities will be based in England!!! So York, Exeter, Nottingham and Cambridge have all been mentioned so far… but we’re keen to hear others usggestions, so please feel free to leave a comment so we can add it to our travel plans…. And if you’re looking to waste a few minutes over New Year as you wait til the stroke of midnight, we’d love you to explore our new frontpage design at www.lifeinourvan.com…. and give us your thoughts too??? PreviousHeading home for a family Christmas!! !